The lead White House official for immigration policy, Stephen Miller, is quoted as seeking to end all refugee resettlement in the United States. This has caused an uproar. But few appear to realize that the U.S. President, at Miller’s direction, is already most of the way there—and that this policy in the US has big implications for the rest of the world, especially if other countries fail to step up and fill the growing gap. Due to the President’s policy, so far there are about 87,000 refugees “missing” from the US. Here is how I arrive at those rough estimates. First, I need a way of approximately estimating how many refugees would have been resettled in the US if not for the current administration. After all, if refugee arrivals fell, that could be because fewer people needed resettlement. To do that, I use refugee resettlement to the rest of the world, after 2016, to build an estimate of how many refugees would have arrived in the US after 2016 if it had continued to receive refugees as it had before. In the years 2008–2016, refugee arrivals in the US moved in tandem with arrivals in other countries: A year-to-year change of 1 in the number of resettled refugees arriving in a non-US country was associated with a year-to-year change of 1.82 refugees arriving in the U.S. in that year. And the number of refugees being resettled by non-US countries did fall somewhat after 2016. If the US numbers had fallen in tandem, according to the pre-2016 pattern, US refugee resettlement would have fallen even without a change in US policy. This graph shows the actual number of resettled refugees to the US, in solid red, and to all other countries in solid green, in UN data. Between 2016 and 2018, refugee resettlement to the US fell by 61,648, and resettlement to other countries fell by 8,948. 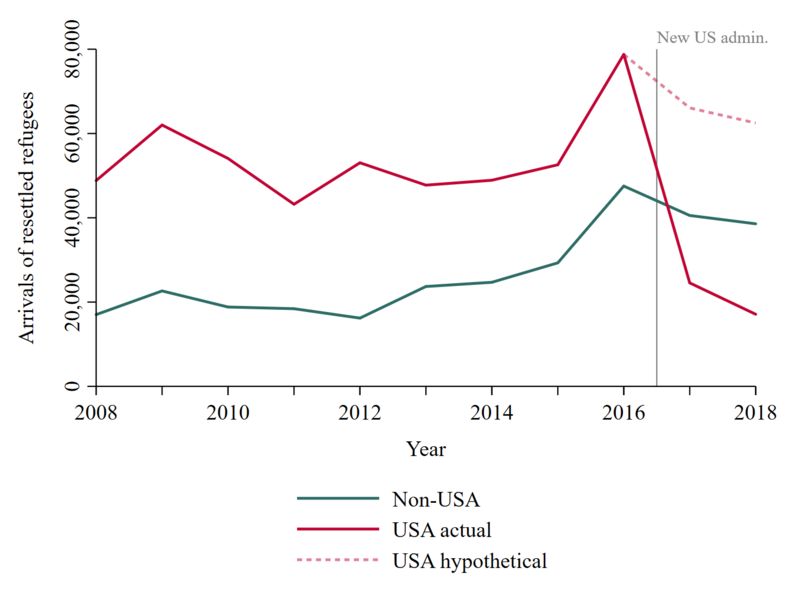 The dotted red line shows how much US resettlement would have fallen if its decline after 2016 had been proportionate to the non-US decline, following the pre-2016 pattern. US resettlement would only have fallen by 16,264. This allows some back-of-the-envelope calculations of the magnitude of the US Administration’s change in policy. First, this means that in 2018, US refugee resettlement was down 73% from what it might have been if the US Administration had not sharply changed policy. That is a great deal of progress toward Miller’s reported goal of eliminating the program. In 2017 the difference between the solid red and dotted red lines was 41,515 refugees, and in 2018 the difference was an additional 45,384. Bottom line: By the end of 2018, there were a total of 86,899 refugees “missing” from the United States: people who would have received protection in America if the US Administration had not closed its doors. Second, it means that other countries are not stepping in to resettle refugees who have been barred from the United States by the current Administration. It is possible that they are doing so in some measure: In the above graph, it is possible that the green line would have fallen even further if the US had not sharply changed policy. But what is clear is that the large majority of those barred from resettlement to the US are not being resettled elsewhere. They simply aren’t being resettled at all. Third, this back-of-the-envelope estimate implies that the US change in policy is singlehandedly responsible for eliminating about half of the world’s refugee resettlement spots. Combining the total actual resettlement by non-US countries with the hypothetical resettlement by the US, total resettlement by the whole world is down 45% from what it would have been if not for the US Administration’s sharp change in policy. The US has singlehandedly eliminated about half of the annual refugee resettlement slots on earth. Something to watch for in 2019: How will the rest of the world respond? Will it accept the de-facto elimination of most refugee resettlement, or pressure the US to alter its course, or increase its own resettlement in response? Download the Stata code and associated data for this analysis here.